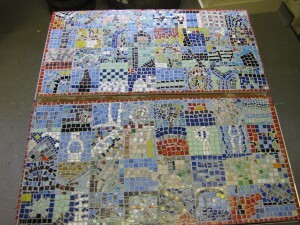 Today I finished off the two mosaic panels I have been making for the School Arts Partnership with Y8 and 9 students from Cricket Green School and Y4 children from Wimbledon Chase Primary. Each child made their own panel, based on drawings they had made at Morden Hall Park, so you can see elements of the water wheel, the white bridge, the mill itself etc. 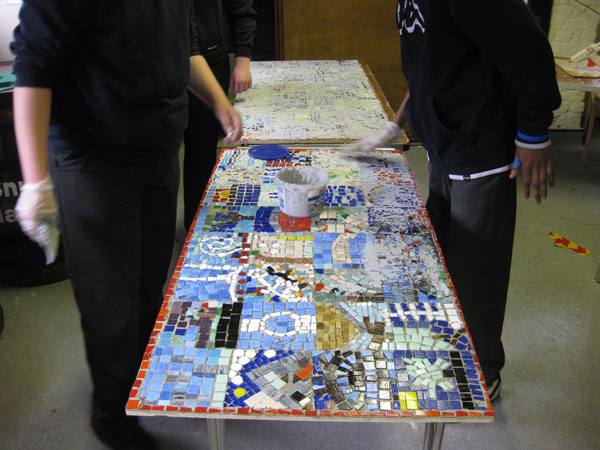 Three Cricket Green students had fun today doing the grouting and seeing the patterns emerge like a patchwork quilt in tiles. 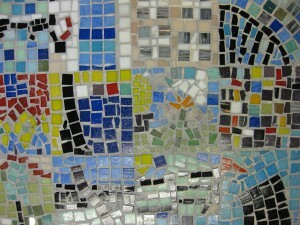 This entry was posted in mosaic, Workshops on March 26, 2009 by Jane Porter. Wow that is amazing, they look so good!